The Governor of Texas, along with other high ranking Republican officials, will be stopping by Southeast Texas soon. They will be coming here to endorse State Representative James White in his re-election big to the Texas House of Representatives against Mike Hamilton in the HD 19 Primary Race which includes Hardin County, Polk County, Tyler County, Jasper County and Newton County. Texas Comptroller Susan Combs has already endorsed James White. James White looks young and possibly not set in his conservative values, but the truth is that he is older than he looks and he is well grounded in his conservative Republican principles. Think about this, James White was an Army officer who served in Berlin under President Ronald Reagan and James White was even in Berlin when the Berlin Wall came down. He is now a rancher, a teacher and an East Texas Conservative Republican State Representative. He got into the Texas Legislature by challenging and beating long time East Texas Democrat State Representative Jim McReynolds. He did not stop there though. He pushed forward and boldly stood for Conservative Christian values during his entire first term. When many State Representatives went along with the establishment and voted Yes to Joe Straus as Speaker of the House, James White stood up and voted no. Joe Straus is a RINO Speaker of the House. He was elected to be the speaker by the Democrats. Straus has been supported by Planned Parenthood and he has even funded and supported Democrats to beat Republicans. Voting against Joe Straus was the first conservative vote by James White, but it was not his last. James White has garnered impressive top Conservative Voting Scores and/or endorsements from all of the most trusted conservative organizations in Texas, such as Texas Right to Life (http://www.texasrighttolife.com/legislators.asp), the Texas Eagle Forum (http://texaseagle.org/legislative-scorecard/2011-scorecard.html), the Heritage Alliance (http://www.heritagealliance.com/tcr/tcrhome.php), Texans for Fiscal Responsibility (http://www.empowertexans.com/2011-fri-taxpayer-champions/), and the Young Conservatives of Texas (http://www.yct.org/wp-content/uploads/ratings/YCT_82nd_Session_Ratings.pdf). Mike Hamilton has told me that the reason Susan Combs is endorsing James White is because Bob Perry (a wealthy Texas home builder) and Texans for Lawsuit Reform have given large contributions to both Susan Combs and James White. Hamilton asked me to look into that and post it on my blog. To be fair to Hamilton, I did look into that connection. What I found is that Bob Perry and TLR both contribute to most Republicans in Texas. In fact, Mike Hamilton has received well over $80,000 from Bob Perry and also large amounts from TLR. The idea that Susan Combs is endorsing James White based on contributions from Bob Perry or TLR is something I do not think is right because Bob Perry and TLR have also contributed tens of thousands to Mike Hamilton too. I am a little upset that Mike Hamilton and James White are facing each other. Mike Hamilton is not a bad guy. I have had some issues with Mike Hamilton over the years like when Hamilton recently authored a bill to try to bring casinos to Texas and when he voted for Straus to be Speaker of the House (Straus gets his family money from gambling businesses and would greatly benefit from Casinos in Texas). Overall though, Mike Hamilton is a decent guy whom I have known for some time. He is not as good of a conservative or as willing to stand up and be outspoken as James White though. I don't like to play politics or vote for someone because they are my friend or because they have been in office for a long time. I always vote for the best guy and the best guy in this race is James White. That is why I have also made my final decision to endorse James White for State Rep over Mike Hamilton. I have no ill will towards Mike Hamilton. I think Joe Straus is using Mike Hamilton. Joe Straus is attempting to oust Conservative Republican James White by putting Hardin County into James White's new district. Joe Straus knew that Mike Hamilton (one of the Chairmen under Straus) was planning to move from Orange County to Hardin County after redistricting. Straus wanted to try to get James White out of the legislature so Straus put James White in the same district as Mike Hamilton. Mike Hamilton ultimately was the one to make the decision to move to Hardin County to face James White. Hamilton could have stayed in Orange County and would have run against State Rep Allan Ritter. Ritter is only 50% conservative and there are even Democrats with a higher conservative rating that Ritter. Hamilton would have easily been the better conservative in a race against Ritter and I would have campaigned hard for Hamilton to beat Ritter. I wish Hamilton would have stayed in Orange County. Hamilton did not decide to stay in Orange County though. Hamilton decided to move to Hardin County and face Super Conservative Republican James White. That was a bad move because James White is the better, more exciting Conservative Republican. The reason Mike Hamilton is making this run IS to facilitate casino gambling in Texas- in this next session. Their last polling of the state House members came up with 92 votes- 8 short of what they need. Many of the matchups are to give them the chance to have a good change at getting the 8 additional votes they need. Lanf in San Antonio, Austin, and Irving is already laid out for this purpose, with Straus and his buddies looking to get wealthy off those tracts. This will be THE fight this time around, folks; rest assured of that! A few years ago when Mike Hamilton was running for re-election against one of the Democrat tort lawyers, I attended a fund raiser for him that was organized by the Jefferson County and Orange County Medical Societies. Guess who was the guest of honor? 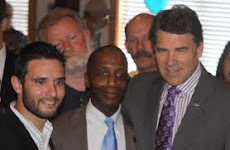 Rick Perry! Hamilton won, and later his vote in favor of passing tort reform was very important. So I find it odd that Perry has now decided to endorse White. It probably has to do with the big push for expanded gambling in Texas like casinos. Perry is against it and Hamilton wrote the bill to try to expand gambling in Texas. Hamilton also does not have a high conservative rating like he did years ago. Mike Hamilton is lying to His Voters! A Vote for Mike "Tuffy" Hamilton is a vote for Casinos and Expanded Gambling in Texas. A Vote for Hamilton is a vote for RINO Speaker Joe Straus to be able to pass a gambling bill that will bring millions to Joe Straus' Gambling business and cost the residents of Texas dearly. This is one of the most important races in Texas because if Hamilton wins he will use his Chairman position to try to bring casinos and gambling into Texas. Hamilton has been telling his conservative and Christian east Texas voters that he is not for casinos or expanded gambling in Texas. He knows that his voters do not want casinos or expanded gambling in Texas so Hamilton tells them what they want to hear. Hamilton tells them he is not for gambling. Check out this article from a guy in Lumberton, TX in Hardin County. http://hardincountyconservatives.blogspot.com/2011/05/mike-hamilton-kills-gambling-bills.html This article says that Hamilton told his constituents that he is not for Casinos or gambling. Mike Hamilton even told them that he killed the gambling bill just for them, his constituents. He has been lying to his constituents in order to get votes. He is slick and only cares about the almighty dollar, not his voters. Hamilton is the author of HJR 112 which would legalize casinos and expand gambling in Texas. Hamilton has also voted for casinos and expanded gambling in past legislative sessions. Hamilton is an outspoken advocate for gambling and will keep trying to get it until it passes. Hamilton will tell his voters one thing but then turn around and do something else of a check from the gaming industry. Hamilton told his voters that he killed the bill for them but the truth is that Hamilton could not get the votes to pass the bill because most voters in Texas and even the Republican Party of Texas Platform are against Casinos and expanded gambling in Texas. The Governor also said he would veto it. That is why Hamilton's gambling bill died. It died because it was not going to pass. It did not die because Hamilton cares about his voters. promises promises promises..... but no return on the investment.... just more crime and more families and lives ruined and money sucked out of homes. Did the Lottery for Education? NO! It is a tax on the poor. Governor Perry says gambling is not the way to build a solid economy in Texas. If gambling was the way to solve state financial problems then Nevada would be doing great, but Nevada has serious financial problems. Two candidates that shouldn't appear in their own ads. Both come across as totally fake. Tuffy with an assault rifle? James "Farmer" White on a tractor? Why don't they just tell it like it is. They both have suckled the mighty legislative teet and neither wants to be redistrictly weaned. Who's more conservative? Who cares! Who's gonna represent the citizens? I fear neither. Long post yet very interesting and substantial, got lots of information there, we all do have our own opinions and strategies, let's just see what will happen next.